We welcome everyone to apply to join our team - from those just embarking on their careers to seasoned professionals. 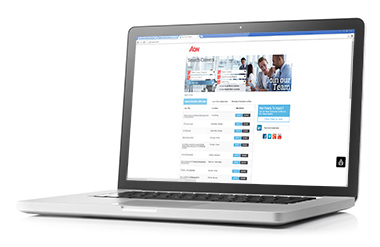 Visit jobs.aon.com and browse Aon careers by country, category or a keyword. It's our mission: We are driven to empower economic and human possibility for clients, colleagues and communities around the world. These aren't just words at Aon. It's an increasingly volatile world, and our work is about creating greater security, stability and opportunity for our clients and their people. It's our clients: At Aon, everything starts with the client. The Aon Client Promise sets the foundation for trusted client relationships. We put listening to our client's needs and understanding their goals at the heart of everything we do. It's our colleagues. Being a part of Aon means having opportunities to make a difference - whether you support a local organization, serve a large global account or support colleagues who support clients. Join Aon, and you'll find many moments when you know you've done something worthwhile. In our inclusive culture, everyone has opportunities for growth and development. We know that leveraging the diverse cultures, backgrounds, and experiences of our colleagues improves work quality, fosters innovation, and enhances results. We have a distinct responsibility to have a sustainable, positive impact on our communities and our colleagues. We go to great lengths to make certain our operations are environmentally friendly and help clients "go green"—while adhering to the most rigorous business conduct standards. Aon is committed to creating a winning and inclusive culture where everyone has opportunities for growth and development. We invest in diversity programs to ensure Aon promotes an inclusive, open culture with diversity in thought and style. Our diversity and inclusion initiatives and opportunities for clients and colleagues to give and volunteer are proof of the value we place on diversity. For more information visit our Diversity & Inclusion page. Our volunteers represent the best of Aon by demonstrating a commitment to service that extends beyond our day-to-day business responsibilities and into our communities. Each year, Aon employees devote thousands of hours of service to charitable organizations and educational institutions around the world. Aon is committed to ensuring an accessible online application process for all candidates, including individuals with disabilities, by offering an alternative way to apply for job openings. The alternative application method is only available for those who cannot otherwise complete the online application due to a disability or other need for accommodation. Aon provides reasonable accommodation to applicants under the guidance of the Americans with Disabilities Act (ADA), Section 503 of the Rehabilitation Act of 1973, the Vietnam-Era Veterans' Readjustment Assistance Act of 1974, and certain state and/or local laws. For assistance applying for a job in the UK or to discuss reasonable adjustments please email our Inclusive Recruitment Champion. For assistance in other geographies please email Aon Recruiting. Please do not use this alternative method for general inquiries, status of applications, or other non-access questions.